In keeping with its mission of providing engaging visual and performing arts dialogues within its walls, Augusta Savage Gallery will present Korean dancer and choreographer Song Hee Lee in an intimate dance performance on Tuesday March 30th at 7pm. 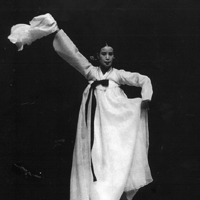 Lee’s personal style draws on both modern and traditional Korean dance forms. She has developed a style of dance that manages to be contemporary and timeless, international and Korean, intensely personal and deeply transpersonal. In 1991, her first solo performance, “Waiting for a Man,” received national recognition in Korea for its unique combination of traditional and modern, as well as Eastern and Western aesthetics. With the goal of further exploring Western dance influences, Lee moved to the Unites States in 1997. Continuing her work within the context of the New York dance world, she no longer thinks of her choreography as a synthesis of Eastern and Western forms, but rather as the starting point of a new tradition – what she calls “the third way.” “Karma,” her third solo performance and New Yorkl debut, received a strong and affirmative review in the New York Times.